QPHY-BROADR-REACH Automotive Ethernet enables faster data communication to meet the demands of today’s vehicles and the connected vehicles of the future. QPHY-BroadR-Reach automates testing and validation of 100 Mb/s Automotive Ethernet, which is described in both the BroadR-Reach and 100Base-T1 (IEEE 802.3bw) specifications. DDR Debug Toolkit The DDR Debug Toolkit provides test, debug and analysis tools for the entire DDR design cycle. The unique DDR analysis capabilities provide automatic Read and Write burst separation, bursted data jitter analysis and DDR-specific measurement parameters. GRL-USB-PD GRL-USB-PD software provides a simple and efficient way to perform USB-PD electrical parametric and protocol measurements. GRL-USB-PD provides waveform visibility and protocol analysis making it ideal for design and debug of USB Type-C Power Delivery silicon and end products. GRL-USB-PD-C1 GRL-USB-PD-C1 is a flexible test controller, designed for USB-PD Compliance testing of the Unit Under Test (UUT) and more. QPHY-10GBASE-KR The Teledyne LeCroy QPHY-10GBase-KR solution automates testing for 10Gigabite Ethernet Copper Backplane base on the IEEE 802.3ap specifications. The test framework simplifies the test setup and execution of generic and common test requirements such as jitter separation, rise/fall time and transmitter equalization parameters. The guided wizard prompts the user to for specification required patterns and takes the measurements accordingly. The test report includes the test results pass/fail summary, margins and limits, as well as waveforms and measurements used during the test process. QPHY-10GBASE-T QPHY-10GBASE-T automated compliance test software performs electrical compliance testing of the Physical Media Attachment (PMA) for 10GBASE-T Ethernet PHY, based on IEEE802.3-2008 requirements. QPHY-DDR2 The Teledyne LeCroy QPHY-DDR2 Test Solution is the best way to characterize DDR2 memory interfaces. Capable of performing measurements on 400 MHz, 533 MHz, 667 MHz, 800 MHz, 1066 MHz and custom speed grades, QPHY-DDR2 has a full suite of Clock, Electrical and Timing tests as specified by the JEDEC Specification and Intel JEDEC Specifications Addendums. QPHY-DDR3 The Teledyne LeCroy QPHY-DDR3 Test Solution is the best way to characterize DDR3, DDR3L, and LPDDR3 memory interfaces. Capable of performing measurements on 800 MT/s, 1066 MT/s, 1333 MT/s, 1600 MT/s, 1866 MT/s, 2133 MT/s and custom speed grades, QPHY-DDR3 has a full suite of Clock, Electrical, and Timing tests as specified by the JEDEC Specification. QPHY-DDR4 DDR4 is an evolutionary upgrade from DDR3. It introduces data transfer rates which are nearly double the DDR3 transfer rates, ranging from 1.6 GT/s up to 3.2 GT/s. DDR4's higher transfer rates and lower operating voltage have driven new test methodologies and test requirements which were not previously required for DDR3 in order to ensure proper signal fidelity. QPHY-DDR4 has a full suite of Clock, Electrical, and Timing tests as specified by the JEDEC Specification which will aid in DDR4 design validation. QPHY-DisplayPort The QPHY-DisplayPort software option provides an automated test environment for running all of the normative real-time oscilloscope tests for sources in accordance with Version 1.2b of the Video Electronics Standards Association (VESA) DisplayPort PHY Compliance Test Specification, as well as tests for HBR3 signals at 8.1 Gbps. QPHY-EDP QPHY-eDP provides a highly automated and easy-to-use solution for Embedded DisplayPort source testing in accordance with version 1.4 of the VESA Embedded DisplayPort PHY compliance test guideline. QPHY-ENET Ethernet testing compliant with IEEE 802.3-2005 requires many test setups and connections and mask tests. Using Teledyne LeCroy QualiPHY-ENET these measurements are easy to setup and complete. Instructive connection diagrams and message boxes appear as pop ups on the oscilloscope screen. The connection diagram instructs the user how to change test fixture and jumper pins in order to do complete test. 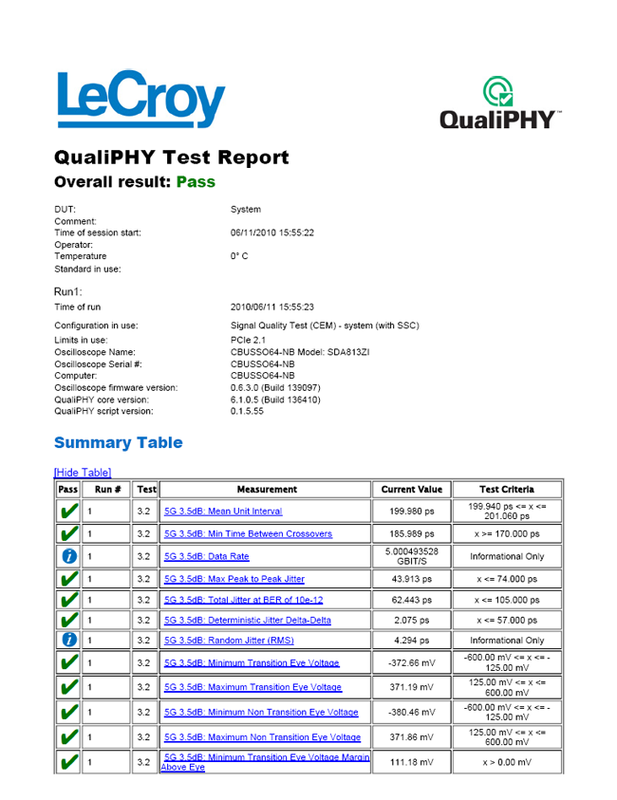 When the tests are complete, QualiPHY will generate a test report in PDF, HTML, or XML formats. Jitter and pulse mask tests are performed with automatic waveform alignment, and all test results feature pass/fail indicators corresponding to the standard being tested. QPHY-HDMI2 automated and easy-to-use solution for HDMI transmitter testing in accordance with Version 2.0 of the HDMI Compliance Test Specification (including testing for version 1.4 devices). QPHY-LPDDR2 The Teledyne LeCroy QPHY-LPDDR2 Test Solution is the best way to characterize LPDDR2 memory interfaces. Capable of performing measurements on 466 MHz, 533 MHz, 667 MHz, 800 MHz, 900 Mhz, 1066 MHz and custom speed grades, QPHY-LPDDR2 has a full suite of Clock, Electrical and Timing tests as specified by the JEDEC Specifications. QPHY-MIPI-MPHY The QPHY-MIPI-MPHY Test Solution provides automated control of Teledyne LeCroy oscilloscopes for performing transmitter physical layer tests as described by the MIPI Alliance Specification for M-PHY version 3.0. QPHY-MOST150 The Teledyne LeCroy QPHY-MOST150 compliance test package provides a highly automated and easy-to-use solution to MOST compliance testing. QPHY-MOST150 will perform all electrical compliance tests as defined in the MOST150 oPHY Automotive Physical Layer Sub-Specification Rev. 1.1 and MOST150 cPHY Automotive Physical Layer Sub-Specification Rev 1.0. 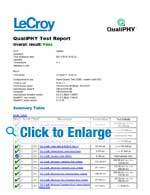 QPHY-MOST50 The Teledyne LeCroy QPHY-MOST50 compliance test package provides a highly automated and easy-to-use solution to MOST compliance testing. QPHY-MOST50 will perform all electrical compliance tests as defined in the MOST Electrical Physical Layer Specification Rev. 1.1. QPHY-PCIE3 Teledyne LeCroy QPHY-PCIe3 Test Solution provides automated control for Teledyne LeCroy oscilloscopes for performing transmitter physical layer tests as described by the PCI Express Base Specification Revision 3.0 Version 0.9 and the Card Electromechanical Specification Revision 3.0 Version 0.7. QPHY-SAS2 The Teledyne LeCroy QPHY-SAS2 Test Solution provides automated control for the SDA 8 Zi series of oscilloscopes for performing all of the transmitter physical layer tests as described by version 1.01 of the UNH IOL Serial Attached SCSI (SAS) Consortium SAS-2 6Gb/s Physical Layer Test Suite. 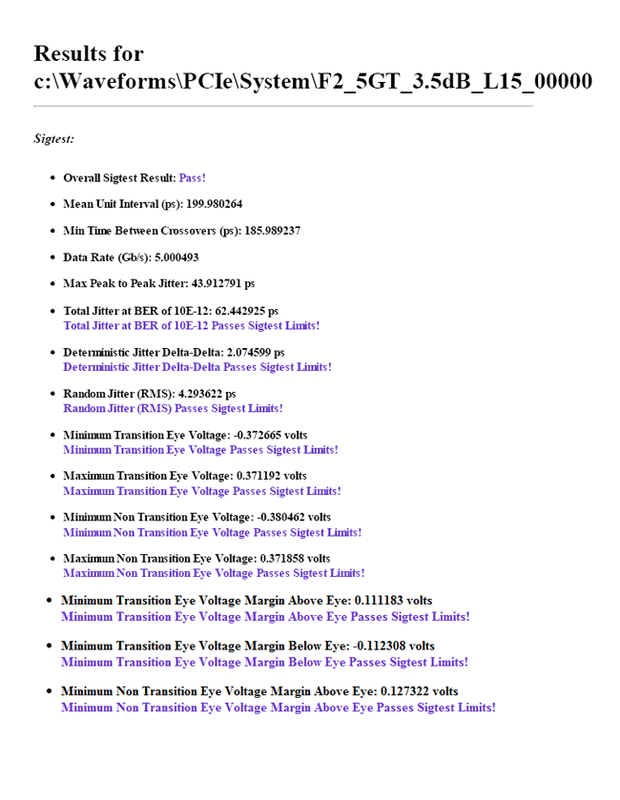 This specification covers targets and initiators running at 1.5 Gb/s, 3.0 Gb/s and 6.0 Gb/s. QPHY-SAS3 The QPHY-SAS3 Test Solution provides automated control of the SDA 8 Zi-A and LabMaster 10 Zi oscilloscopes for performing all of the transmitter physical layer tests as described by the T10 SAS-3 specification. This specification covers targets and initiators running at 1.5 Gb/s, 3.0 Gb/s, 6.0 Gb/s, and 12.0 Gb/s. QPHY-SATA-TSG-RSG for SATA compliance testing to be used in conjunction with the PeRT3. By leveraging the capabilities of both the oscilloscope and the PeRT3, QPHY-SATA-TSG-RSG can automatically perform all of the PHY, TSG, OOB, and RSG tests as described by the SATA UTD 1.5. Furthermore, QPHY-SATA-TSG can be configured to test Gen1, Gen2, and Gen3 SATA PUTs. QPHY-SFI The Teledyne LeCroy QPHY-SFI solution automates testing for SFI base on the SFF 8431 specifications. The test framework simplifies the test setup and execution of generic and common test requirements such as jitter separation, rise/fall time and transmitter equalization parameters. The guided wizard prompts the user to for specification required patterns and takes the measurements accordingly. The test report includes the test results pass/fail summary, margins and limits, as well as waveforms and measurements used during the test process. QPHY-USB The USB package provides a complete acquisition and analysis system for USB 2.0 devices, hosts, and hubs, as specified in the USB-IF USB 2.0 Electrical Test Specification. The test software implements a full set of electrical tests for USB 2.0, including High-, Full-, and Low-speed tests and is supported by Teledyne LeCroy’s QualiPHY automated test and reporting software. QPHY-USB3-Tx-Rx SuperSpeed USB is one of most highly anticipated standards in several years. At 10x the data rate of USB 2.0 and with new features like CTLE (continuous time linear equalization) and reference channels, SuperSpeed USB will pose new challenges to implementers. QPHY-USB3.1-TX-RX QPHY-USB3.1-Tx-Rx offers an automated test package for USB 3.1 transmitter and receiver compliance testing, characterization, and debug. Connection diagrams display proper setup using the PCI-SIG Compliance Base Boards and Compliance Load Boards. Testing requirements for both system boards and add-in cards are described by the specification. QPHY-PCIe has the ability to test compliance in accordance with the specification for both system boards and add-in cards. 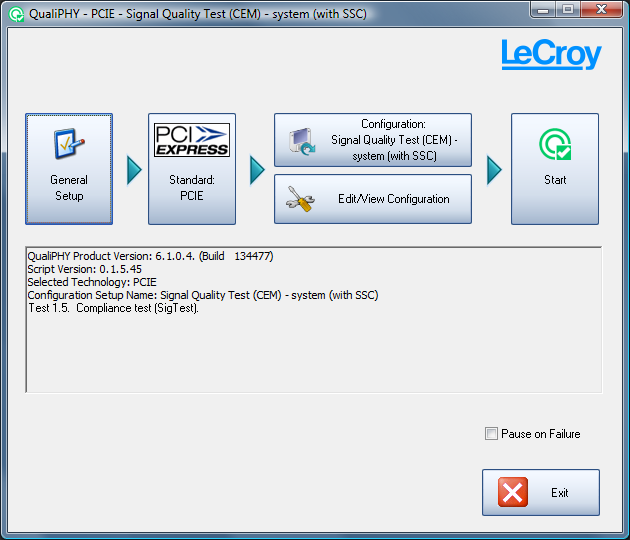 By integrating the SigTest libraries into the oscilloscope software, QPHY-PCIe can fully automate all of the required compliance tests using the exact same algorithms that are described by the specification. Additionally, QPHY-PCIe can run all of the 2.5GT/s tests, then all of the 5.0GT/s with 3.5dB of de-emphasis test, and finally all of the 5.0Gt/s with 6.0dB of de-emphasis tests. This allows the user to create one test report for all 3 testing phases. These capabilities make QPHY-PCIe an all-inclusive automated test suite that meets the requirements for 2.5GT/s and 5.0GT/s PCI Express transmitter compliance testing. 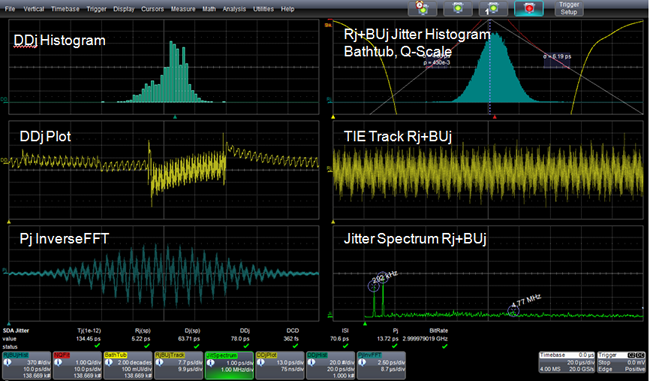 By integrating the SigTest libraries into the oscilloscope software, the exact algorithms provided by the PCI-SIG are used for calculating the results. 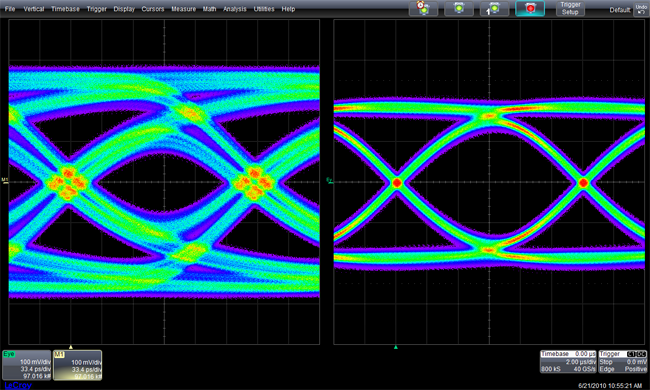 This ensure the same exact answer as running the stand alone SigTest utility with the added benefit of being able to run this utility from within the oscilloscope software. Measurement results often need to be summarized and tabulated to quickly verify specifications. This information, together with instrument and signal acquisition/test condition setups, results in a fully documented record. QPHY-PCIe streamlines this process by incorporating an automatic HTML report generation engine. The created test reports contain tabulated numerical values for each individual test result, including PASS/FAIL and specification limit columns. Reports can also be saved as PDF, HTML or XML. If a compliance failure is found, Teledyne LeCroy's SDA II serial data analysis package is available to help find the root cause quickly and easily. SDA II has the ability to perform Eye and Jitter measurements simultaneously and is fully integrated into the oscilloscope application software. In addition, with specialized features such as IsoBER, ISI Plot, Pj Inverse FFT and multiple jitter models, SDA II provides insight into the measured Eye and Jitter parameters making it easier to identify the sources of problems. The Eye Doctor II analysis software allows the user to view their signal after Continuous Time Linear Equalization (CTLE), Feed Forward Equalization (FFE) and/or Decision Feedback Equalization (DFE). This gives the user to ability to see how an actual receiver that utilizes equalization would interpret their signal. 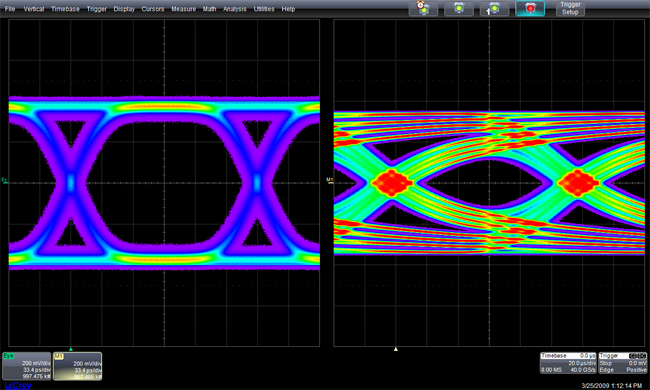 Teledyne LeCroy's SDA II analysis software contains integrated jitter and timing analysis for clock and data signals. It allows analysis of data up to the memory limit of the oscilloscope and using X-Stream II technology, SDA II can display eye diagrams and jitter decomposition results up to 50 times faster than other solutions. Additionally, the specific PLL for PCI Express is selectable from a list of pre-configured PLLs. Lastly, SDA II contains 2 separate methods for jitter decomposition; the industry standard spectral method, and the NQ-scale methods. NQ-scale is critical for properly distinguishing between random and deterministic jitter in systems where cross-talk is present. Additionally, the Eye Doctor II analysis software also enables channel emulation. For PCIe testing, a design engineer will perform their serial data measurement at the output of the transmitter. However, analysis at the far side of a reference serial data channel is very useful for debugging problems.. To accomplish this they could either use a physical channel to make their measurement after the channel or they can use channel emulation to see what their serial data signal would look like if it had been transmitted through the channel.